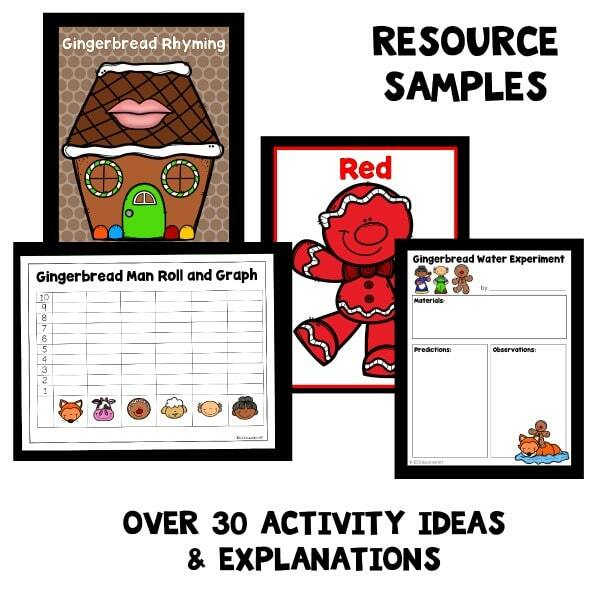 The tale of The Gingerbread Man is a classic children’s favorite that can be explored in so many fun ways with young kids. Whether you’re reading your favorite gingerbread books during the holiday season or as part of a gingerbread theme there are a lot of ways to incorporate additional academic skills. 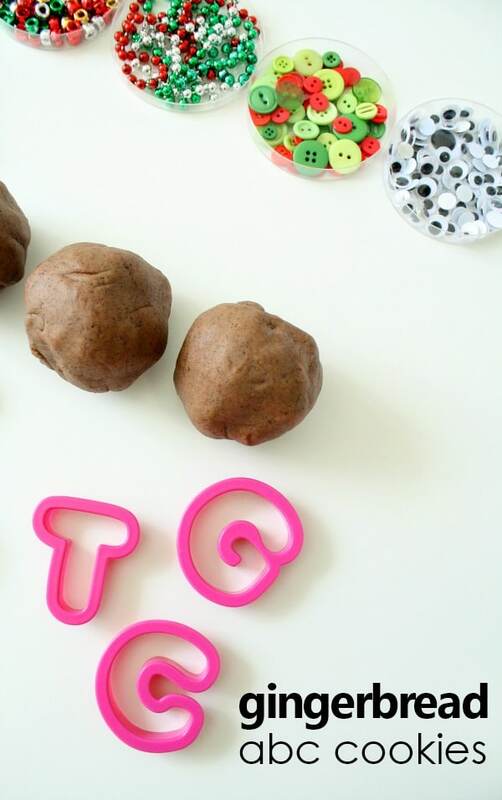 In this gingerbread play dough ABC activity kids exercise those fine motor muscles and engage in pretend play as they make and decorate letters (and numbers too!). Gingerbread Play Dough-It smells AMAZING! Dough cutters-We pulled our letter and number cutters from this set. 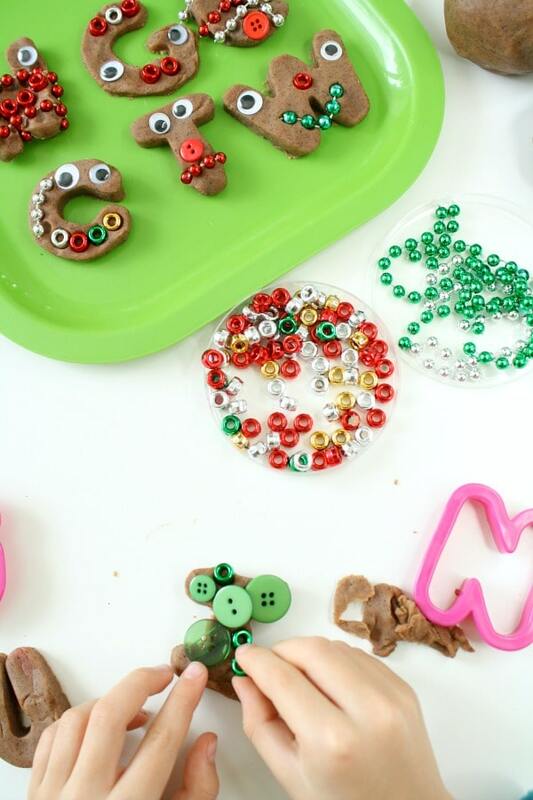 Assorted loose parts for decorating-We used red and green buttons, beaded necklaces trimmed to assorted lengths, holiday colored metallic pony beads, and googly eyes. 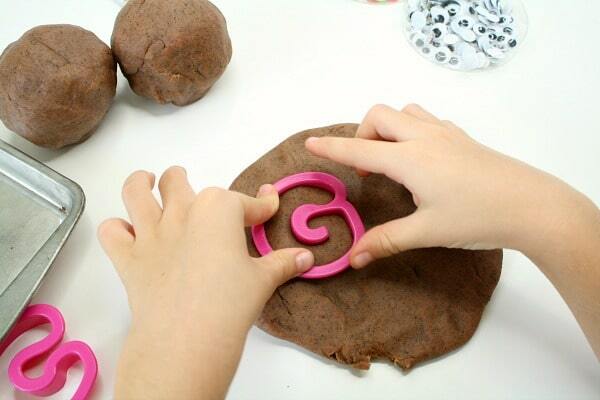 For added pretend play fun grab a spatula and any other accessories you’re little ones like to use for baking. If you have a chef costume or apron, put it on, too. We love the Melissa & Doug Chef Costume. You can decide which letters to set out for kids to work with. If you have little ones just beginning to learn letters, start with the ones in their name to make it more personal. If you are working with older kids who know most of their letters but need help remembering a handful of them, go ahead and use those letters. You can differentiate as needed for small groups of students. It’s so much fun to see how kids approach this activity. 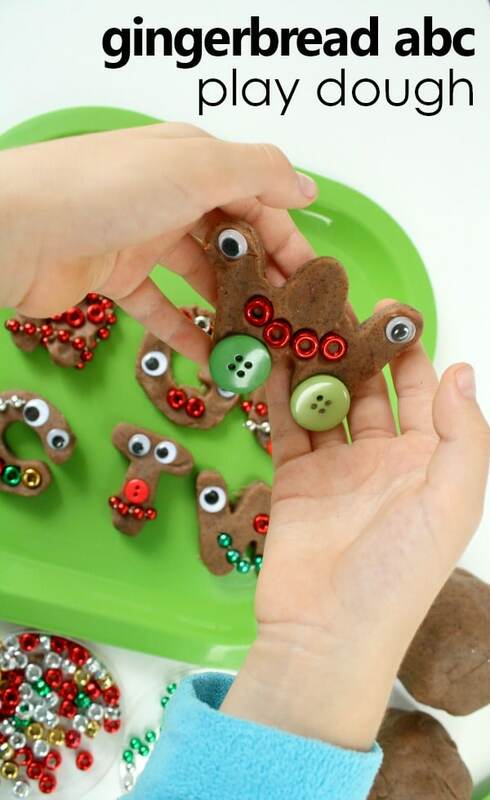 Some will make littler gingerbread letter people. Others prefer to make them look more like traditional cookies. Still others like to trace the outline of the cookie to match the letter. All approaches are welcome, and without a doubt all of your gingerbread cookies will end up being unique! Kids love serving up their pretend play cookies. If you can, let kids serve their creations to you or to friends in the home living center. 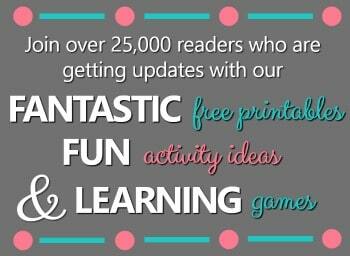 This extends the opportunities for vocabulary development, social interaction, and FUN! 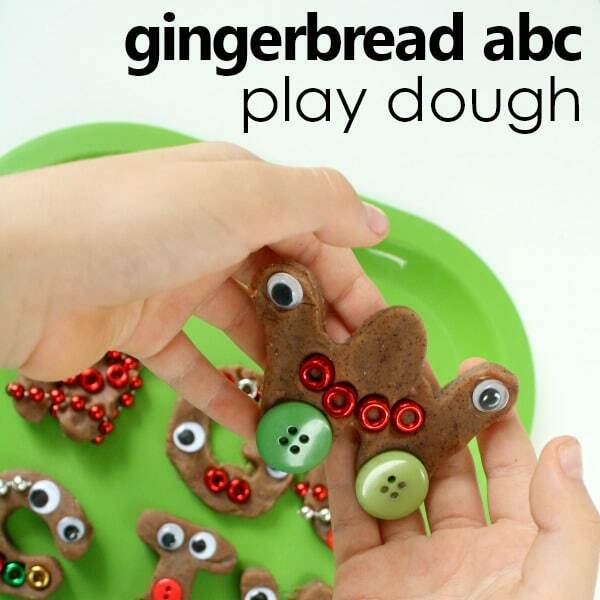 After kids have had time to create ABC gingerbread cookies, this center can be repurposed to focus on math concepts. 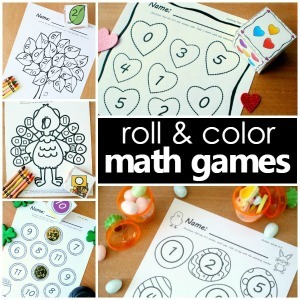 Simply reuse the same materials and switch out the alphabet cutters for number cutters. 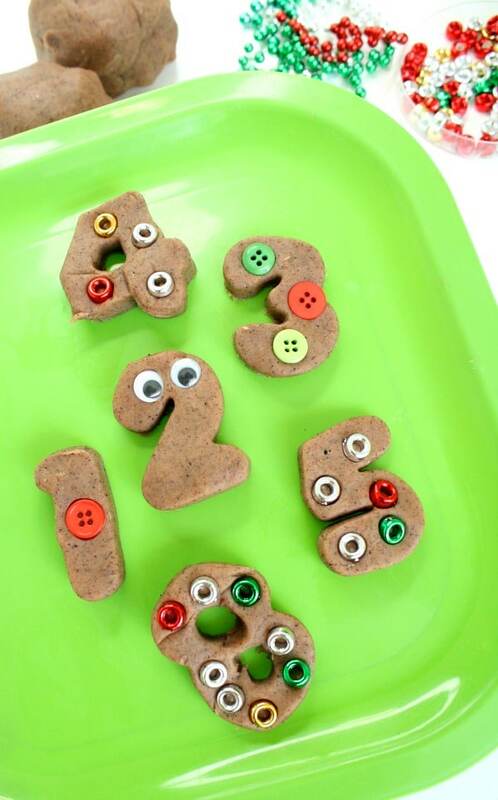 Kids can decorate the numbers as they did with the letters or they can match the number of objects with the number cookie they’ve made. See more of our ABC creations in action. Kindergarteners who are working on spelling the number words can also use the letter cutters to spell out the number word that matches their number. 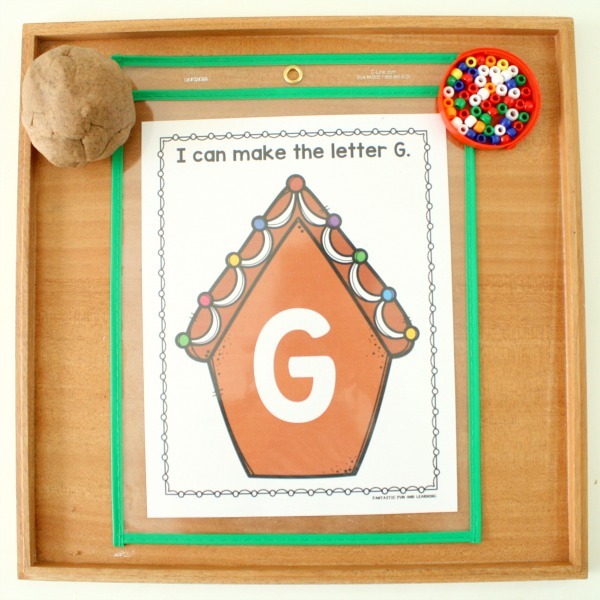 Want a printable version of this activity to help guide kids with letter formation? 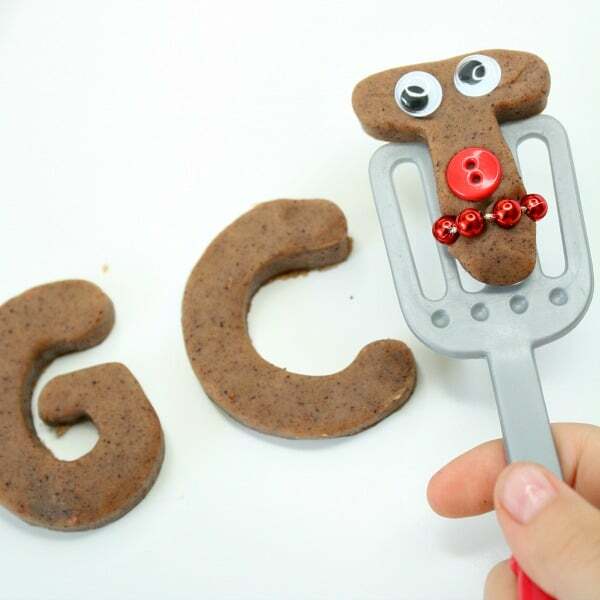 Download our free printable gingerbread ABC mats.